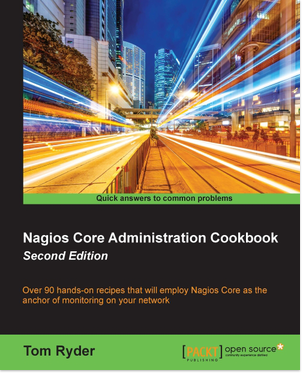 In February 2016, Packt Publishing released the second edition of my book, the Nagios Core Administration Cookbook. It’s available in both ebook and paperback formats. It’s in cookbook style, with some 386 pages of material in eleven chapters on making Nagios Core work as the centerpiece of network monitoring for busy systems administrators, including discussions on SNMP monitoring, passive checks, distributed and redundant monitoring, intelligent notification based on network structure and function, integrating with other tools like MRTG and RRDtool, and a few of the more essential extensions to the monitoring system. The target audience is systems administrators who might know enough about Nagios Core to set it up to send PING requests to a few hosts and to email them, or perhaps check a few sites are working with check_http, but that haven’t really done much else with the system and are looking for some recipes for expanding and refining its monitoring behavior to suit their network. For those less familiar with Nagios Core the first couple of chapters recap the very basics of hosts, services, and commands.